Today is day three of guest posts while I'm busy with VBS at my church. It's a long week after several months of planning, but the kids are having so much fun! We picked the Everest VBS kit this year, so the church looks like a hiking expedition on Mount Everest. 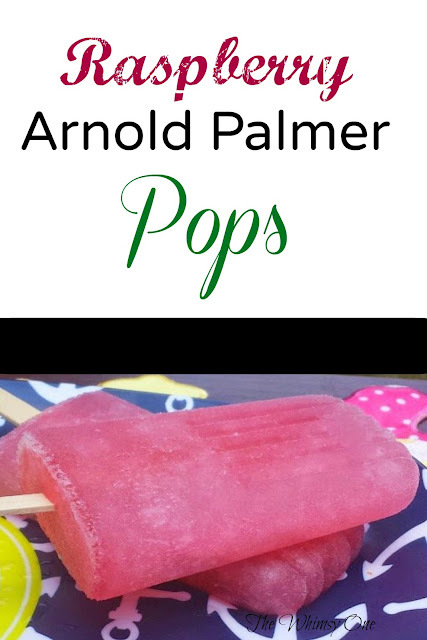 While I'm helping the kids, Maddie is here to share her healthy recipe for Raspberry Arnold Palmer Pops. Welcome, Maddie! Hi guys. My name is Maddie and you can usually find me at my blogs, The Whimsy One and ThankFull Tummy. I usually ramble on about recipes, my favorite cocktails and our frequent travel. I sometimes touch base on more serious issues such as my battle with mental illness and our long term struggle with infertility. I am so glad that Cari let me share a recipe with you guys today and, if you have a chance, I hope you will stop by and check out my space. One of my favorite summer treats to whip up is Popsicles. I am always experimenting and trying new flavor combinations. I tend to find myself coming back to raspberry and lemonade and this go round, I decided to make a version that is reminiscent of a popular drink here in the south, the Arnold Palmer. I have made quite a few cocktails of the Arnold Palmer variety and always with a twist. I just knew that a frozen version would be perfect with all of these extremely hot temps we have been subjected to these last few weeks! While your standard Arnold Palmer mixes lemonade with sweet tea, I mixed this recipe up by using raspberry lemonade and green tea. The drink version with rum is so refreshing and the popsicle is no different. You could always add a little alcohol to it, just adhere to the 80/20 rule. In order for it to fully freeze, you shouldn't use any more than 20% liquor. and you'd want to freeze for a full 24 hours. Brew the green tea, using two tea bags with 1 1/2 cups of water to get a very full tea flavor. You can now use sweetener to taste or if you would prefer, no sweetener at all. In a pitcher, mix with the lemonade and combine thoroughly. If you really wanted to keep this low calorie, Tropicana has a light raspberry lemonade. You will need Popsicle molds and sticks. I prefer to use a funnel so there is no spills. Fill to just below capacity as the liquid will expand when it freezes. Place in the freezer and after one hour, put Popsicle sticks in place. Freeze for at least 8 hours. When they are fully frozen, run the molds under hot water and slowly release from their mold. I hope you will enjoy these colorful and tasty treats as much as I did! Thanks again for having me over today, Cari!